This year I started taking my daughter to preschool two days per week. As I would walk her to her class, I couldn’t help but notice a gentleman walking his son to school with a seeing eye dog. Amazed, I just had to meet this family. Finally, I had the opportunity to meet the father, Scott, his wife Christina, and his son Collin. To my surprise, not only was the father blind, but so was his wife. Their son is the cutest, sweetest little boy I’ve ever met. As we became friends, we would chat at school as our kids played together. It was so refreshing to hang out with such down to earth people! I would mainly see Scott, because his wife works full time. In fact, he is the stay at home dad; a real Mr. Mom. Of course we all know that behind every great man, there is an amazing woman, right? Well, that woman is Scott’s wife, Christina. Here is her amazing story. Christina Katherine Panczak, was born in West Palm Beach, Florida and grew up in Jupiter, FL. I suppose you could say that she is one of the few natives left in this state and county for that matter. She explains that her childhood was a wonderful one, although not without some unique challenges along the way. She was born with an eye condition known as Optic Nerve Hypoplasia. This is a condition where the optic nerve does not develop properly. She was officially diagnosed with this condition when she was a mere five months old. Her parents made a conscious decision early on that they would raise her no differently than any other child. Their goal was to guide her to become a self sufficient, independent, successful woman. Growing up, Christina had two younger brothers who watched out for her. She played ball with them, rode her bike, and participated in all of the various activities other kids were involved in. Her parents even made sure that she learned to water ski and snow ski. She still enjoys these activities today along with marathon running and sky diving! Christina attended regular school, but was mainstreamed during this time to enable her to learn the necessary adaptive equipment and skills needed to be successful. She learned to type, read large print as well as Braille, and received rehab teaching to enable her to function in the home. Christina was expected to participate in household chores and do her school work just like her brothers. Apparently, her parents efforts to raise a confident and independent woman were successful. Here is Christina’s amazing story in her own words. ” I graduated from William T. Dwyer High School with a regular diploma. I went on to Palm Beach Community College where I earned my AA in Psychology. I later went on to Florida Atlantic University where I earned my Bachelors degree in Social Psychology. Finally, I obtained my Graduate degree from FAU as well. I received my Masters in Education in Counselor Education with a specialization in Rehab Counseling. Throughout my college career, I received services from the Offices for Students with Disabilities at both PBCC and FAU. I was able to receive my exams in an alternative format, take extra time for exams, and tape my lectures. I also wrote my papers with the help of software known as JAWS which stands for Job Access with Speech. I still rely on this software today in my job as a Certified Rehabilitation Counselor. I graduated with my Masters degree in May, 2005 with my dog guide Joanie by my side wearing her own cap and gown. I obtained a job with the Florida Division of Blind Services in August of that same year and this is where I remain employed today. The Division played a major role in which I have become today as well. In fact, they provided me early interventive services from the time of my diagnosis, guided me through my childhood and teenage years, and assisted me with college. Therefore, I am honored to give back to an agency that has given so much to me. That brings me to the present. I married my husband Scott in May of 2004. We have been happily married now for 7 years. Interestingly enough, my husband is also blind and has a dog guide as well. The two dogs were best friends, as are my husband and I. Our family expanded in 2007 to include our son, Collin James who is fully sighted. I do not parent any differently than any sighted parent. I believe that you do not need to see to love. I am sure that raising a sighted child will present some challenges, but parenting is a challenge in and of itself. I recently faced one of those many challenges that parents, sighted or not must invariably face. On February 8thof this year, I lost my Seeing Eye dog Joanie. I was faced with the difficult challenge of explaining to my son that Joanie went to Heaven to live with God. This was a difficult time for our family and me, but her loving memory and her spirit will be with us always. On a happier note, I am blessed to have a son who already at such a young age understands that his parents do things a little bit different. Collin, who will be 4 in July, understands that his mom and Dad’s eyes are broken. Collin, Scott and I enjoy family activities such as going to the pool, going to the park, and going on family trips. 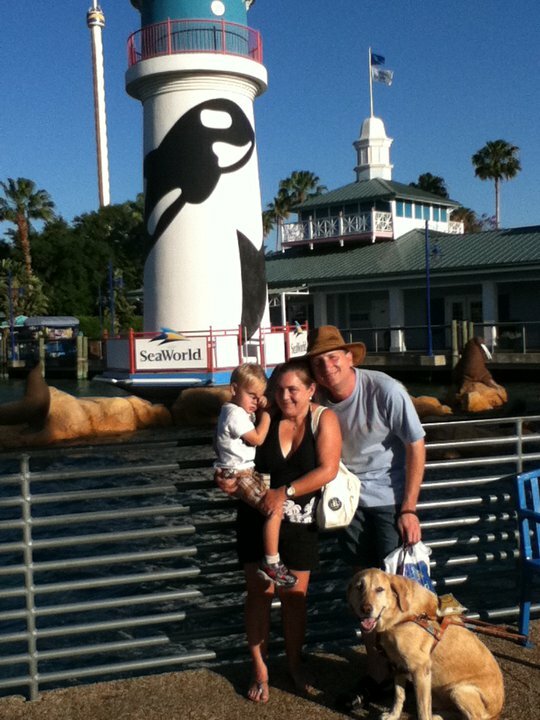 In fact, we recently went to Sea World for a fun family trip. It was the first time we all went as a family together without the aid of family or friends. 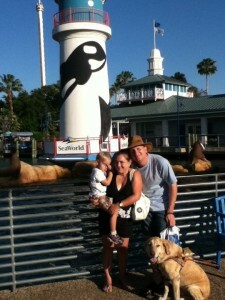 With careful planning, we took the train, obtained a hotel and went to Sea World. Collin was a trooper. Collin got to decide where he wanted to go and what he wanted to see. The trip was a big hit and so was Nemo, the Seeing Eye dog. I truly believe, however, that it takes a village to raise a child. I’m fortunate enough to live close by to my parents and brothers who are a major part of my life and the life of Collin. The support of my husband and all of my family has been vital. I value and appreciate my family and I would not be where I am today without their love and support. I also value my education. Education is something that nobody can take from you, so I continue to educate myself. Finally, I plan to pass down my values of family, Faith, and education to my son. To conclude, even though I was born with a visual disability, I have not let this condition hinder me in achieving my goals. My family and the Florida Division of Blind Services have also provided me with the tools I needed to become the successful individual I am currently. Staying active physically, educating myself, spending time with family, and serving my clients are all important to me. I have had the wonderful pleasure of watching my beautiful son blossom into a fine young man. My hope for him in the future is that he keeps his faith, continues to learn and grow as a person, and that he remains true to himself. I am truly honored to be a successful wife and working mother”, Christina writes. By the way, did I mention that she is training for the Walt Disney World Marathon next year? It is an honor to call the Smith family my friends. I learn something from them everytime I am around them. I have also learned to take the time everyday to be thankful of what I am blessed with and also to know I can do anything I put my mind to. Thank you Christina! You are truly a woman who inspires me! Loved Reading about Christina and her amazing family. Christina thank you for being an inspriation to women and families everywhere!